We fully appreciate our tradition for solid, reliable socket sets and have developed a retro socket set that celebrates this legacy. Manufactured using modern practices from hardened and tempered chrome vanadium steel, which is chrome plated and polished for added corrosion protection. 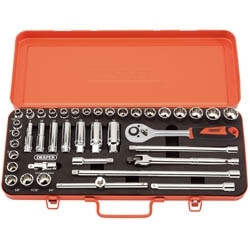 This superior manufacturing process delivers several advantages, including improved longevity of the tools and enriched comfort, and it's supplied with a foam inlay tray in a heavy gauge steel storage case.